Just because astrocytes shield neurons from threats doesn’t mean they do so voluntarily. Injured motor neurons prompt astrocytes with “help me” signals, according to a paper in the October 27 Nature Communications. Researchers led by András Lakatos of the University of Cambridge, England, and Rickie Patani of University College London reported that the ephrin type-B receptor (EphB1) on neurons engages a ligand on astrocytes, which then ramps up expression of neuroprotective and anti-inflammatory genes in the glia. This lifeline appeared to be lost in a mouse model of amyotrophic lateral sclerosis (ALS), and in astrocytes derived from ALS patient stem cells. The findings could help explain how neurons become vulnerable to damage in ALS and possibly other neurodegenerative diseases. Astrocytes can either nurture neurons—tending to their synapses and bathing them in nutrients—or pummel them with damaging inflammation that hastens their death. How the glial cells sway in one direction or the other is a matter of intense research. Some studies report that feisty microglia transform astrocytes into agents of damage, while other contend that signals from damaged neurons steer the trajectory of the glial responses (see Jan 2017 news; February 2017 news; Hooten et al., 2015; Murdock et al., 2015). Understanding the drivers of astrocytic behavior may be of critical importance in the context of ALS, in which neuroinflammation is linked with rapidly progressing disease (see Mar 2017 news). First author Giulia Tyzack and colleagues asked if signals delivered by injured motor neurons might rally astrocytes to protect them. Specifically, they investigated whether EphB1—a receptor expressed on neurons in response to injury—might send signals to astrocytes by binding its ligand, ephrin-B1, on the astrocyte surface (Wang et al., 2005). Ephrin receptors and their ligands are known to work bidirectionally, transducing signaling cascades into both the ligand and receptor bearing cells upon engagement (Klein, 2009). To provoke such a response, Tyzack and colleagues snipped the axons of facial motor neurons in mice. They found that EphB1 expression nearly tripled in the damaged cells within a day and continued to rise for another week. Astrocytes in the vicinity of the damaged motor neurons ramped up expression of the ephrin-B1, and had elevated levels of phosphorylated STAT3, a hallmark of astrocyte activation. The researchers next investigated the nature of the activation of astrocytes by EphB1. When they treated cortical mouse astrocytes with recombinant EphB1 in a clustered state, mimicking the conformation of the receptor on the neuronal surface, astrocytes responded by phosphorylating STAT3 and shuttling it to the nucleus. This also occurs in response to IL-6, a cytokine known to ramp up inflammatory responses in astrocytes. Both EphB1 and IL-6 also boosted GFAP expression on astrocytes, and triggered the cells to transform into a reactive shape. However, the two proteins evoked dramatically different gene-expression profiles in the astrocytes, with many differentially expressed genes being involved in immune response. IL-6 promoted higher expression of pro-inflammatory genes such as Cebpd and Ptx3, while Eph1B boosted higher expression of immune regulators and homeostatic genes. The findings suggest that EphB1 shifts STAT3-mediated processes from potentially damaging pro-inflammatory responses toward neuroprotective ones. To discern whether this transcriptional shift had functional consequences, the researchers triggered excitotoxicity in mouse spinal cord neurons by treating them with glutamate. Cleaved caspase 3, a marker of apoptosis, shot up by nearly 60 percent in response. However, if they first bathed the cells in medium from astrocytes that had been treated with EphB1, then activated caspase only increased by 35 percent. Medium from IL-6-treated astrocytes offered no protection. How would this protective pathway function in ALS? The researchers addressed this by looking for markers of the pathway in SOD1-G93A mice. 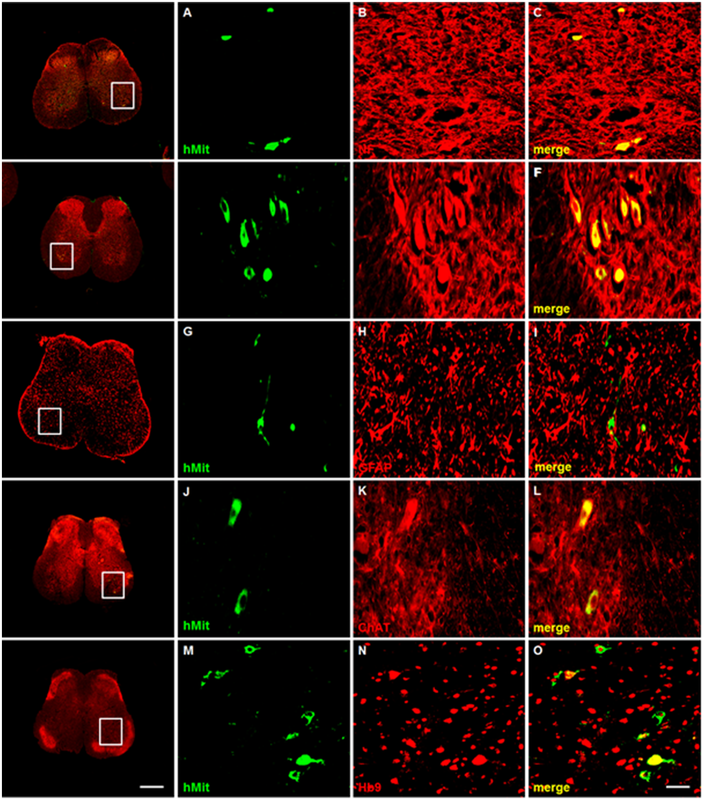 In lumbar spinal cord sections of symptomatic mice, the researchers found negligible expression of EphB1 in neurons, while nearby astrocytes expressed no ephrin-B1 ligand or nuclear STAT3. The same was true in healthy wild-type mice. To see if they could awaken the protective signals, the researchers snipped the sciatic nerve. In response, levels of all three markers rose subtly in both ALS and wild-type mice at day 1. However, while they continued to rise in wild-type mice over the following week, they plateaued in ALS mice. The findings suggested that not only does the protective pathway appear silent in ALS mice, it also fails to switch on in response to acute injury. The researchers next asked whether the EphB1 pathway was more or less active in astrocytes derived from ALS patients compared to controls. They generated astrocytes from human induced pluripotent stem cells (hiPSCs) derived from three healthy controls and two ALS patients who carried SOD1-D90A mutations. They also created an isogenic astrocyte line from one of the patient cell lines, correcting the disease mutation using transcription activator-like effector nucleases (TALEN). Compared with astrocytes from healthy controls or with the corrected patient cells, SOD1-D90A mutated astrocytes upregulated more than 1,900 transcripts and downregulated more than 2,500. This pattern had hints of an inflammatory signature, including five genes known to be upregulated in response to IL-6 in mice, and five downregulated transcripts that had gone up in response to EphB1. Among these 10, expression of PHLDA3, a tumor suppressor with links to cell death, nearly doubled that in normal cells, at both the RNA and protein level, while expression of HSPB8, a protective heat-shock protein, fell 10-fold. These findings suggested that astrocytes from ALS patients had a more pro-inflammatory profile than control cells, and that the protective EphB1 pathway might be muted. Together, the findings indicate that activation of astrocytes can have multiple outcomes. “The field has been biased in thinking that astrocyte reactivity equals neurotoxicity, but in fact it can be neuroprotective as well,” commented Serge Przedborski of Columbia University in New York. “This duality is something we’ve overlooked for years.” Przedborski and others have long demonstrated that astrocytes gain toxic functions in ALS models. In light of the current findings, researchers should now also consider the potential effects of astrocytes losing neuroprotective functions, he said. 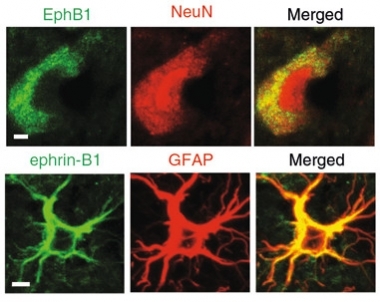 The authors acknowledged that it is still unclear how Ephrin B1 signaling provokes protective responses, or what factors actually protect neurons. Przedborski added that given the complex web of communication between neurons and astrocytes, it is likely that factors beyond Ephrin B1 are involved. Tyzack GE, Hall CE, Sibley CR, Cymes T, Forostyak S, Carlino G, Meyer IF, Schiavo G, Zhang SC, Gibbons GM, Newcombe J, Patani R, Lakatos A. A neuroprotective astrocyte state is induced by neuronal signal EphB1 but fails in ALS models. Nat Commun. 2017 Oct 27;8(1):1164. PubMed. Murdock BJ, Bender DE, Segal BM, Feldman EL. The dual roles of immunity in ALS: injury overrides protection. Neurobiol Dis. 2015 May;77:1-12. Epub 2015 Feb 26 PubMed. Wang Y, Ying GX, Liu X, Wang WY, Dong JH, Ni ZM, Zhou CF. Induction of ephrin-B1 and EphB receptors during denervation-induced plasticity in the adult mouse hippocampus. Eur J Neurosci. 2005 May;21(9):2336-46. PubMed.